Mahonia lomariifolia is a large upright shrub also known as the ‘Chinese Grape Holly’. Chinese because of the origin, Holly because of the ‘Holly like’ foliage. Not as widely used as it could be this shade loving, winter flowering plant is ideal to brighten a shaded position in the winter border. And yes the berry part of the name, the flowers of Mahonia lomariifolia are followed by attractive dark blue berries, that look like, grapes, used to make jam. Requiring very little maintenance other than the occasional removal of damaged growth. The flowers form at the end of the foliage growth, (terminal flowers) and are a brilliant deep yellow. Reaching a height of around 3m (9ft) with a width of 2m, remember that the foliage is spiky, so best planted a little away from access ares, the rear of the border is excellent, or perhaps as a ‘divider’. 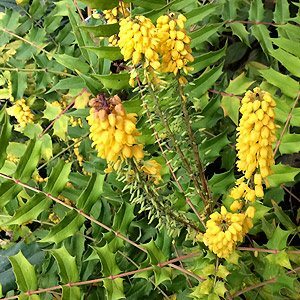 Mahonia lomariifolia is a good plant for in front of a raised deck where you can look down on the flowers on a winters day. Requires little fertilizer and Mahonia lomariifolia cops well with a range of soil conditions.